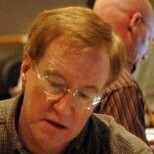 David Slonaker is an American orchestrator. Since 1992, he has participated in more than 70 original soundtracks. He is a regular contributor to the works of Danny Elfman and Alan Silvestri.